Our extended summer has even prompted the somewhat picky "Irish Cream" rose to bloom a third time this year. I was really taken with the caramel color of the full blown bloom against the backdrop of the Japanese maple tree that's just beginning to turn. Since I was younger, I've always thought of autumn roses in a special way. Maybe it's the light that shines down on them, illuminating their petals in a magical way. Gorgeous color! The roses in our garden are starting to bloom now again. They like the cooler temps. What gorgeous colors you have captured. I love this shot. Looking back at the older posts I don't know if I ever left a comment, but those pink roses you shot were stunning. See fall does bring us gifts after all. How odd that so many of your plants would still be blooming so late in the year. This rose looks beautiful. That color is magnificent -- all browny-sugary. :) And it does look beautiful against that backdrop of leaves. Gorgeous! Cindy, that rose is absolutely beautiful. Love the unusual color! Such a beautiful rose Cindy! What a pretty blog! I love flowers! And Autumn is my favorite season. 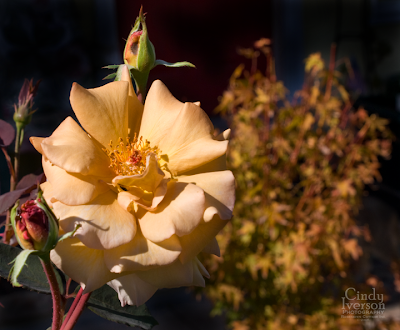 It is common to still have roses through November here in Contra Costa County which is one thing I love about living here--however, when we lived in Colorado, we had one or two December roses, as well. Roses with snow on them are pretty interesting. I just love the color of this one. Luscious is the word that comes to mind. When I can have my own rosebushes, I'm definitely getting an Irish Cream one. Gorgeous!